Breakfast used to be so simple. Just a couple of eggs, scrambled up and stirred with a little cream. Sauteed in the pan, maybe with a little cheese. Voila. Then my kids got bigger. And bigger. Annnnnd bigger. Buttered toast was no longer an adequate side. Neither was a bowl full of cereal and cold milk. Breakfast had to become a full-blown, complete meal. Naturally, I had to come up with ways to fill out my meager morning spread. 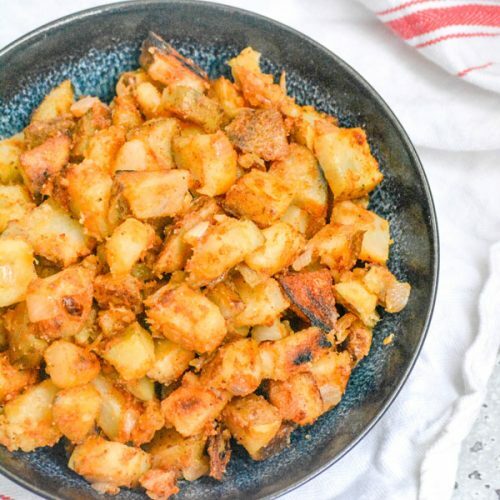 Potatoes quickly became one of my favorite ways to do that, especially these Diner Style Home Fried Breakfast Potatoes. Potatoes are so versatile. They can be the base for, or included in, so many different things. We love adding them to our omelettes, and in breakfast burritos. They also have the added benefit of easily taking on just about any flavor profile you throw their way. It makes them the perfect addition to round out just about any menu. Some days the breakfast menu gets a bit more complicated, usually because I have more time on my hands and my guys all sleep in. Then you get things like my Sausage Egg & Cheese Sliders with Maple Glaze, Breakfast Enchiladas, Breakfast Lasagna, or even our Breakfast Eggrolls with Sausage Gravy. 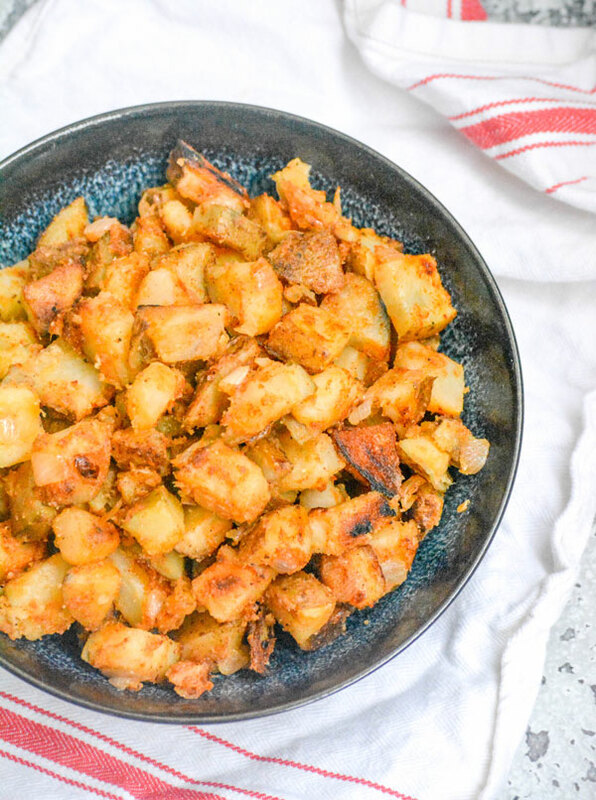 Regardless of how busy my mornings are though, I’ve always got enough time to whip up a batch of these addictive Diner Style Home Fried Breakfast Potatoes. 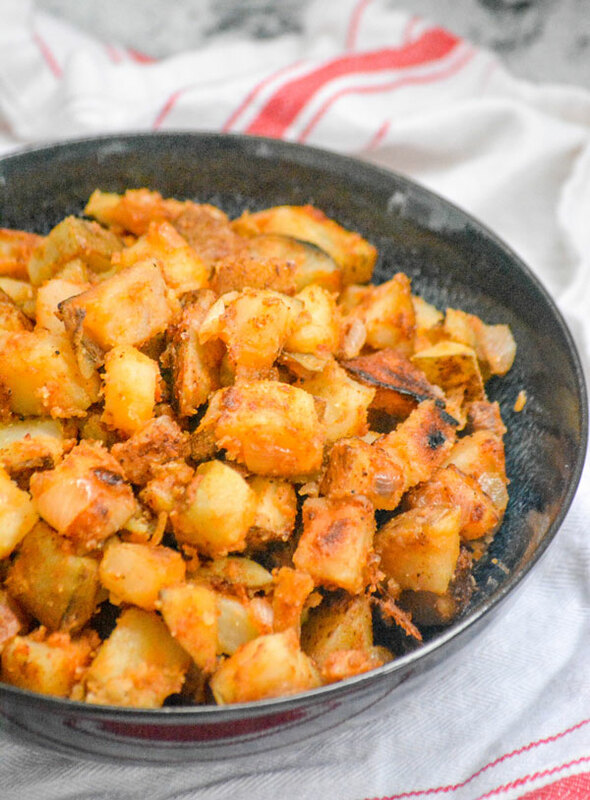 A solid starchy side dish, these fried breakfast potatoes are well seasoned with deliciously crispy, crunchy outsides and smooth, creamy centers. Served up with a side of scrambled or over easy eggs, these potatoes and a side of fresh fruit or even yogurt and you’ve got an easy breakfast on any budget or time frame. Other Breakfast/Brunch recipes you might also enjoy: Monte Cristo Style Breakfast Casserole, Three Cheese Grits Casserole, Cheesy Sausage Ham & Egg Breakfast Calzones, and Sausage & Egg Stuffed Twice Baked Potatoes. 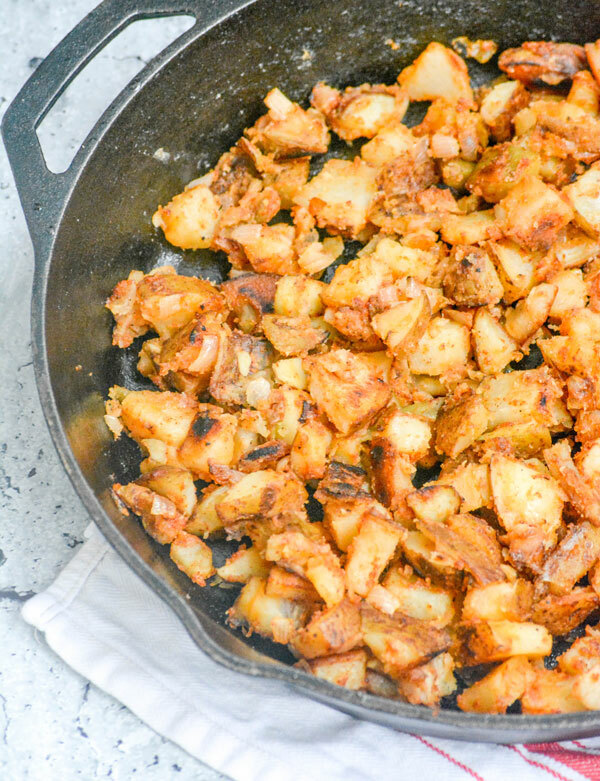 An easy recipe for crispy home fried potatoes that's ready in a jiff to serve with your other breakfast favorites. Add the potatoes to a pot, and cover with water by a 1/2". Generously salt the water. Bring the mixture to a boil and let the potatoes cook for 2 minutes. our the potatoes into a strainer to drain, and let rest for 5 full minutes. 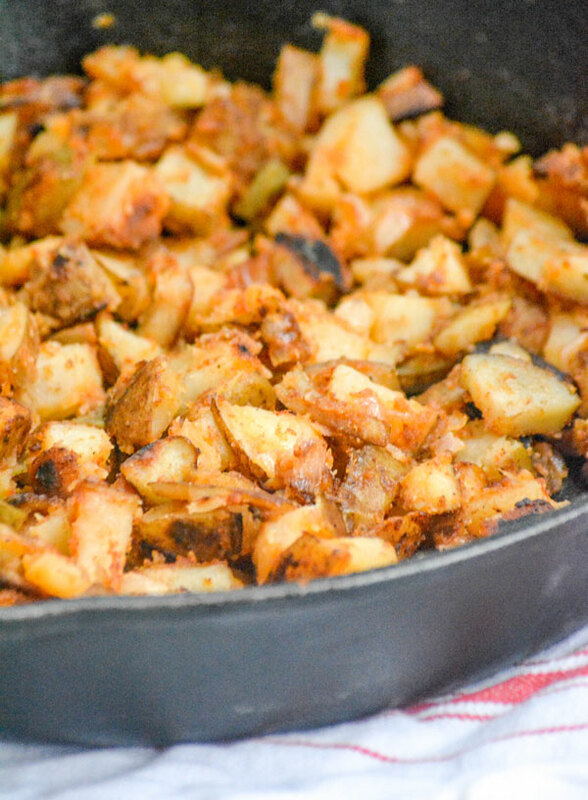 Add 1 tbsp of oil to a large cast iron skillet, and heat it over medium heat. When the oil's nice and hot, stir in the onions. Cook until the onions are soft and translucent, about 5 minutes. Transfer the cooked onions to a separate plate, and return the skillet to the stove. Add the rest of the oil and the butter to the skillet, again heating over medium heat. When the oil's nice and hot, add the potatoes- tossing evenly to coat with the oil and butter. Use a spatula to spread the potatoes out into a single layer. Cook for 10 minutes, only stirring once half way through, so everything gets nice and crispy. Sprinkle to garlic, paprika, salt & pepper evenly out over the potatoes. Add the onions and stir until everything is evenly combined. Serve immediately, alongside your other breakfast favorites. These potatoes were so good!! I made them Sunday morning for Father’s Day breakfast for my family. They absolutely loved them! I thought I boiled them a bit too much but my daughter said they were perfect! So easy to make and oh so tasty!! I served then with homemade french toast of which my son made the bread, thick cut hickory bacon and scrambled eggs with cheddar! I had left overs so the next morning I had them with leftover steak and eggs! !